The Founding Church of Scientology is extending an invitation to you to receive an OCATM personality test and evaluation free of any charge or obligation. Your personality has everything to do with your income, your future, your personal relationships and your life. A test of this kind would normally cost you hundreds of dollars. It is offered to you here free of charge as a public service. If you are not happy with your life, you can find out why. The Oxford Capacity AnalysisTM test is a professional personality test that uses 200 specially designed questions to provide an in-depth look at your personality. It will accurately show you both your strong points - so you can take advantage of them - and your problem areas - those things that are blocking your true potentials and happiness in life. Your results will be displayed on a graph like the one shown here, which rates you against 20 different personality traits. 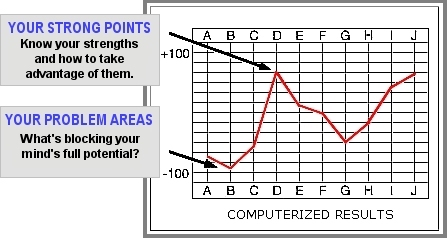 When you complete your personality test, it will be sent to our Testing Department and a graph of your personality profile will be created. To get a proper evaluation of your profile go to The Founding Church of Scientology. The OCA test evaluation is done for free and in person. Persons under the age of 18 must be accompanied by a parent or legal guardian to receive a test evaluation. Answer each question as to how you feel RIGHT NOW. The accuracy depends upon the truthfulness of your answers. This is a free public service and there is no obligation. This is done with the idea that people can know and improve themselves. Please complete this test in one sitting else your Web browsing session will expire and your test answers won't get submitted.